On Tuesday, July 24, 2012 from 6:00 to 8:00 p.m. the Minnesota Renewable Energy Society (MRES) will host a workshop at Cascade Meadow on their Solar Hot Water/Air Heat Group Purchasing Program, Make Mine Solar. Participants will learn the basics of energy efficiency, solar hot water and solar air heat technology, how the group purchase program works, rebates, incentives and financing. Everyone will get a chance to meet the installers and talk to them one on one about their project. It is recommended participants get a site assessment before the workshop so they can bring it along to demonstrate their site better to the installers. Visit the MRES website for more information and to register. A national scam that’s targeting Minnesotans seems to be growing and is now affecting thousands of people across the country. People are getting calls that President Barack Obama will pay your utility bills. It claims you can get $1,000 by providing your social security number and bank routing number. Utility companies warn this fund does not exist and that you shouldn’t give out your personal information. So far, about 1,000 Xcel Energy customers and 500 CenterPoint Energy customers have been affected. If you think you’ve been hit by this scam, contact the Better Business Bureau or police. Energy Fun at the Fair! · A Free Energy Workshop. Attendance in our free “Saving Energy 101” workshop is mandatory to participate in the program – and a great opportunity to learn new no- or low- cost strategies to stop energy waste, all while visiting with your neighbors. Free childcare is provided. Workshops are held several times a year, and the next workshop is scheduled for 6:30 pm on Monday, August 13, 2012 at Bamber Valley Elementary School. · Home Visit and Materials. At the workshop you will have the opportunity to sign up for a Home Visit, where our energy professionals will visit your home for an hour and a half to run diagnostic tests (like a blower door to test air leaks), install energy-saving materials, and find your home’s best opportunities for saving energy and reducing your utility bills. · Help With Next Steps. If our crews find an opportunity for significant savings through installing additional insulation, attic air sealing, or replacing old heating equipment, we can make the next steps easy by connecting you with qualified contractors, financing, incentives, and rebates. The Home Visit, Materials, and Help With Next Steps are all included for a one-time fee of only $40! 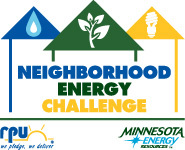 To learn more about the Neighborhood Energy Challenge, visit RPU’s website at www.rpu.org. For energy-saving games, prizes, and giveaways, we’ll see you at the Fair! You are currently browsing the Rochester Public Utilities | Behind the Meter blog archives for July, 2012.